Weaving architectural heritage with contemporary design and lifestyle is a practice that rewards with surprises and character filled places. 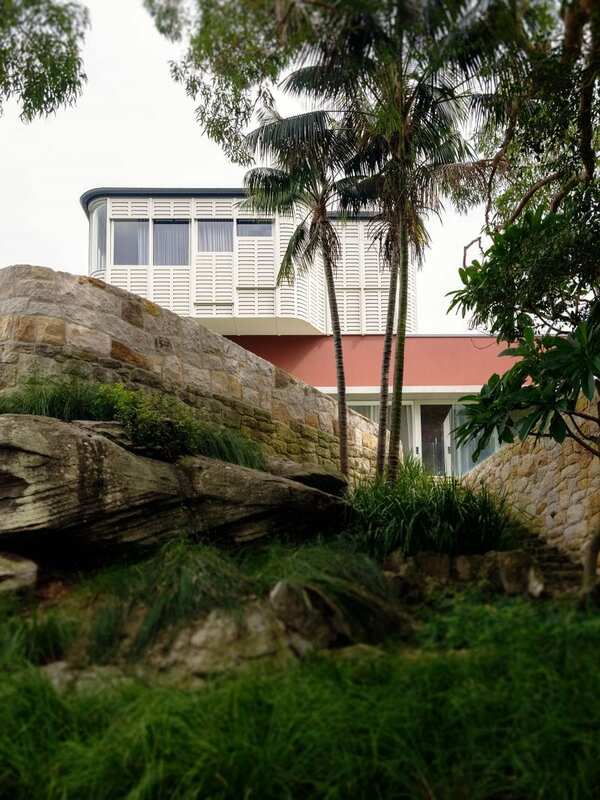 In a conservative residential pocket close to North Sydney, a workers cottage perches on top of a hill looking south-east towards striking views of Sydney Harbour. 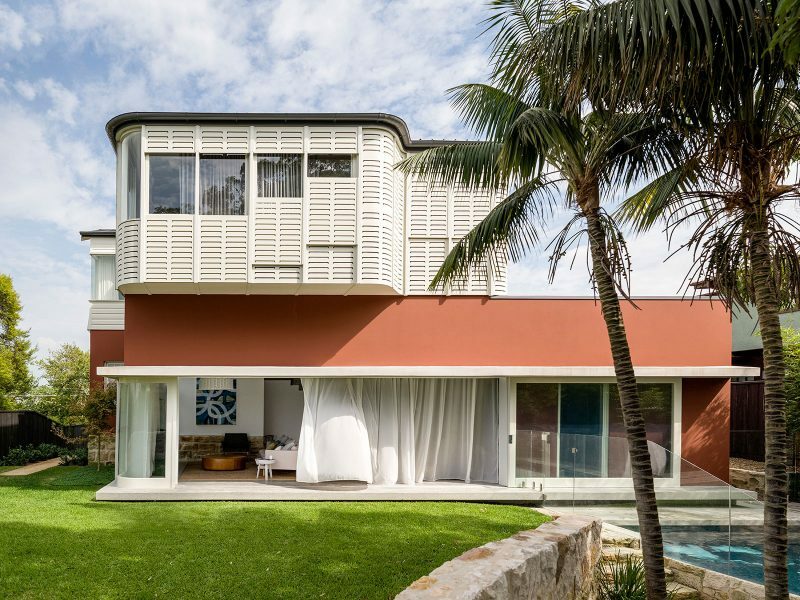 The idea behind the design was to retain the existing character of the cottage to the front – its low slung and strong horizontal lines – and place a more contemporary two storey addition at the back behind the ridge. The new upper level is fully clad with CNC routed plywood shutters, it pierces the ample roof plane to the front of the house with a wide dormer window that is curved at the corners. 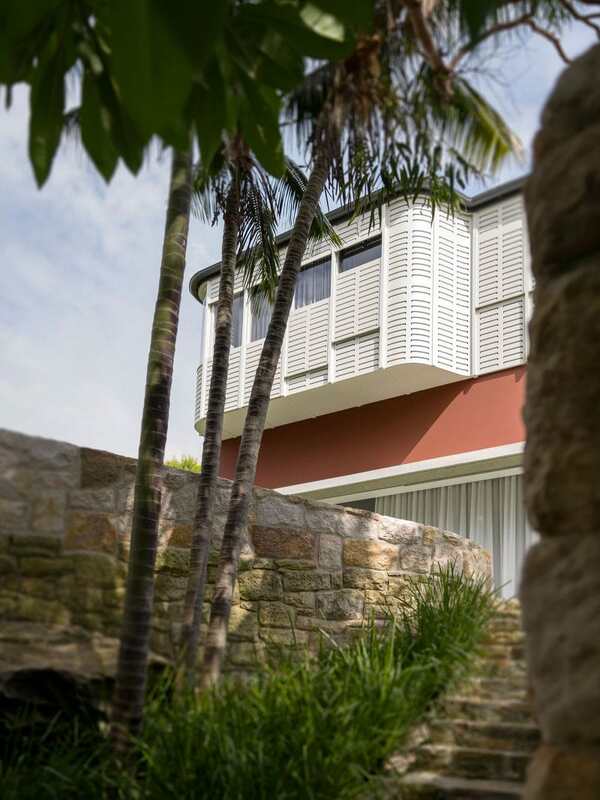 Internally, the skill of Associate Architect, Sean Johnson and Interior Designer, Romaine Alwill have successfully married the old and the new: polished concrete and the existing dark timber floors, oversized glass sliding windows and the original leadlight sashes. 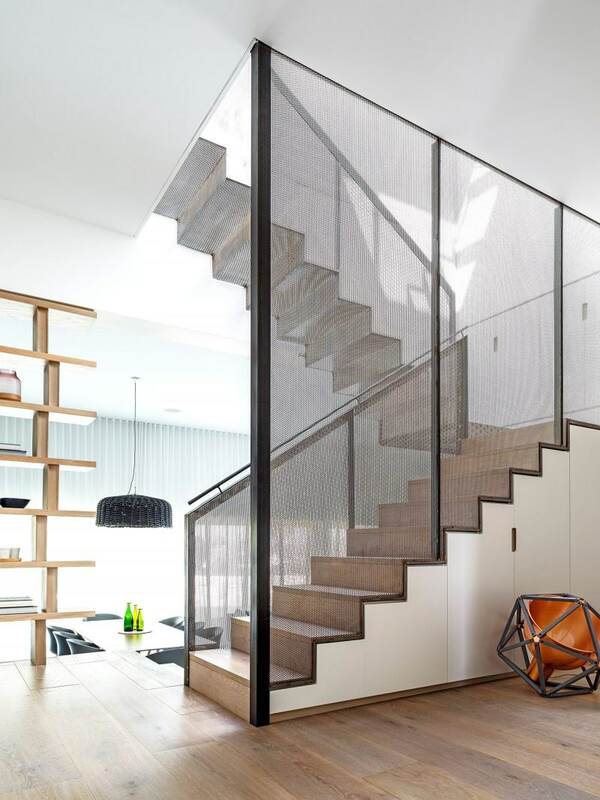 A semi-transparent perforated black steel staircase cascades down through the centre of the house, from an openable skylight in the roof to the ground floor, allowing generous amounts of light to bathe the entrance hall. The young family who own the cottage hoped to be welcomed by their neighbours, but were met instead with dozens of objections to the design, and a tough council process. However, with hard work to convince the community and the vision and support of key Council representatives, the design was approved with some small modifications (the addition of steps to the rear façade and a redesign of the garage door). Today the family can enjoy their views of the Harbour Bridge and have found acceptance in their community. 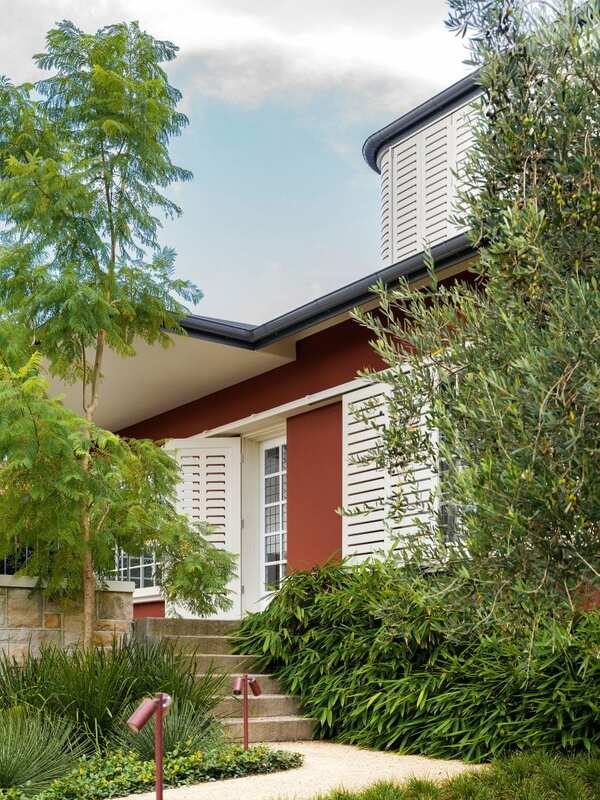 Located on top of a high rock ledge, the new additions to this “craftsman’s” style cottage have great Sydney Harbour and city views, framed by adjustable plywood shutters and the lush Will Dangar designed garden. The right hand side step in the first floor elevation was imposed by North Sydney Council to satisfy the concerns of the neighbours. 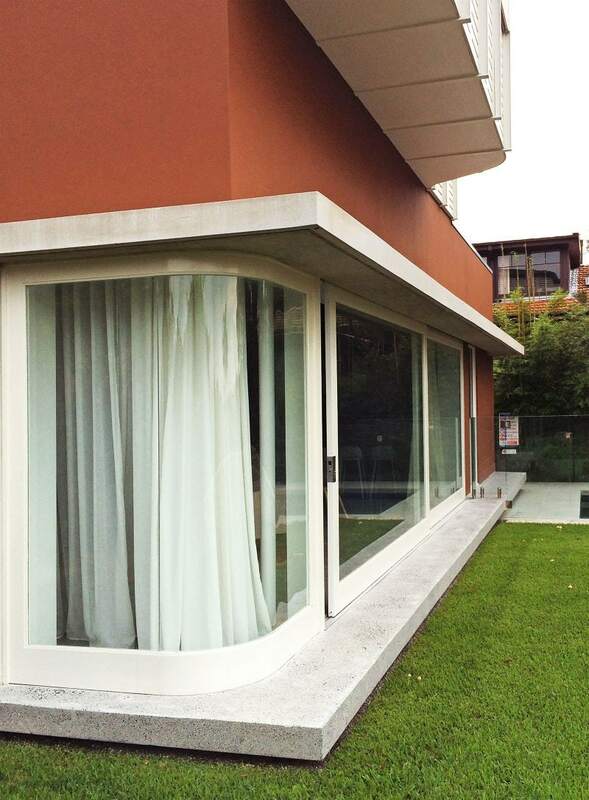 The oversized living room window opening is framed and protected by an off form concrete lintel, and a slab of polished concrete cantilevers over the lawn. The “Oxblood” or “Pompeian” red mineral paint by Porters Paints is a reminder of the original red brick colour of the house. The “Craftsman’s” cottage style of the first decades of the 20th century was characterised by a simple gable roof with low eaves that ran parallel to the street with a horizontal elevation, the complete opposite to the California Bungalow style, with its gables facing the front boundary. The first floor attic dormer and garage have been designed with stretched and horizontal proportions. The existing ground floor windows have new sliding plywood shutters. The sandstone walls have adopted the same type of coursing and jointing as the existing stone footings of the house. The “garden city” ideal town planning concept of the early 20th Century, connected to the “Craftsman” style has been interpreted by the Will Dangar landscaping, large trees have been planted at the front, moulded to the ground contours to facilitate the access to the entry, concealing all the walls and structures behind planting . Next spring we will go back to take photos of the flowering Jacaranda tree. The curved glass allows uninterrupted views off the living room. Off form concrete frames the window. 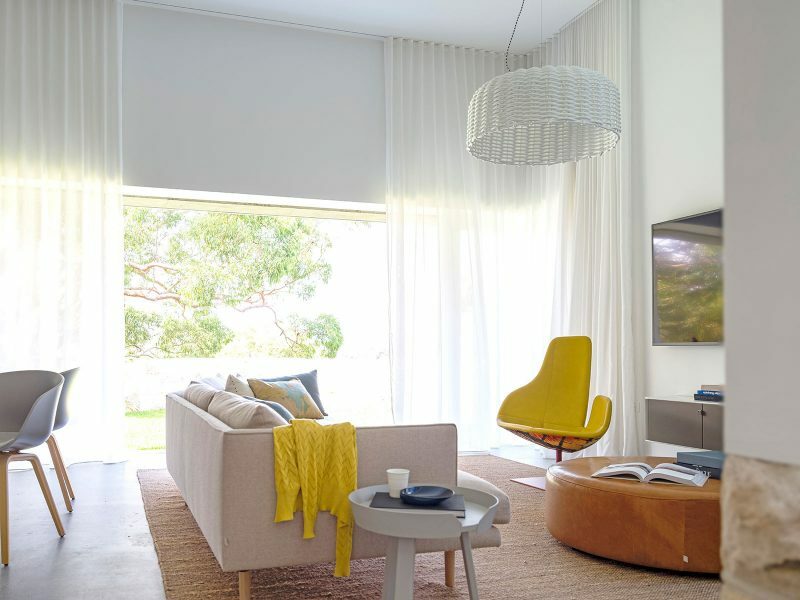 Full length sheer curtains soften the living room corner window, high ceilings contrast with the horizontal window stretch. The Alwill Interiors furniture selections also play on contrasts of shape and colour with the Jordan “Nook” sofa, Moroso “Fjord Relax” armchair, the “Coast” leather otterman, Gervasoni pendant light and Jardan Armadillo & Co rug. 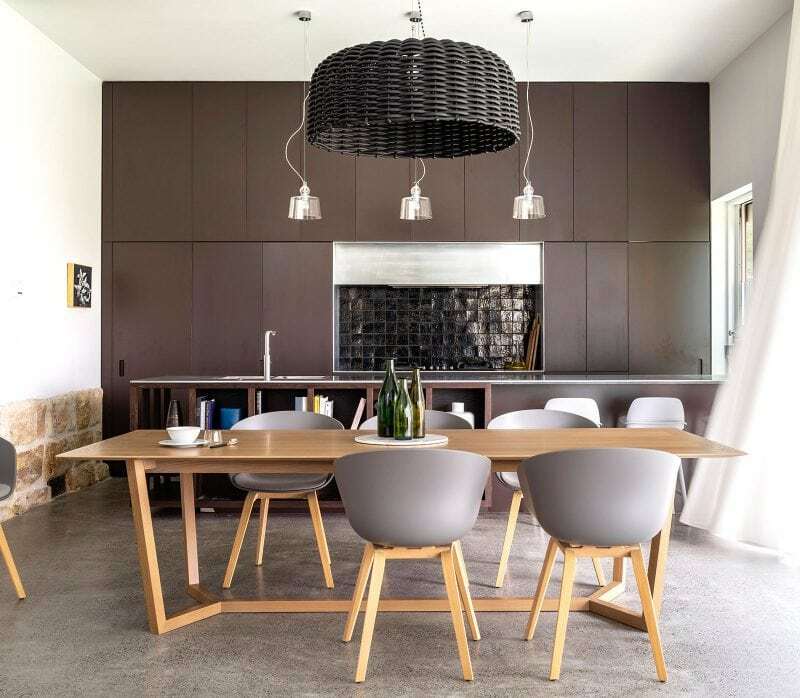 The Romaine Alwill selected CULT table and chairs provide warmth and complement the polished concrete slab, anthracite splash back and “Namadji” painted joinery. The kitchen benchtop is a mill finish zinc, constructed by Sydney Joinery with a bevelled edge. The zinc ages more gracefully than stainless steel, it is traditionally used on bistro benchtops in France where “eau de vie” provides a warm patina. 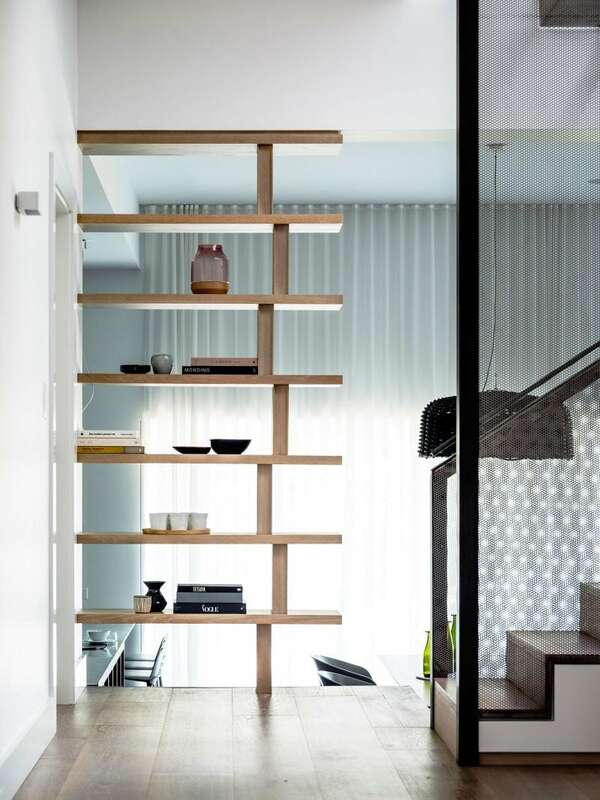 This American Oak bookshelf has CNC routed books as vertical support, complete with book spine and bound covers. To the right we can see the first risers of a stair, leading to the first floor bedrooms. 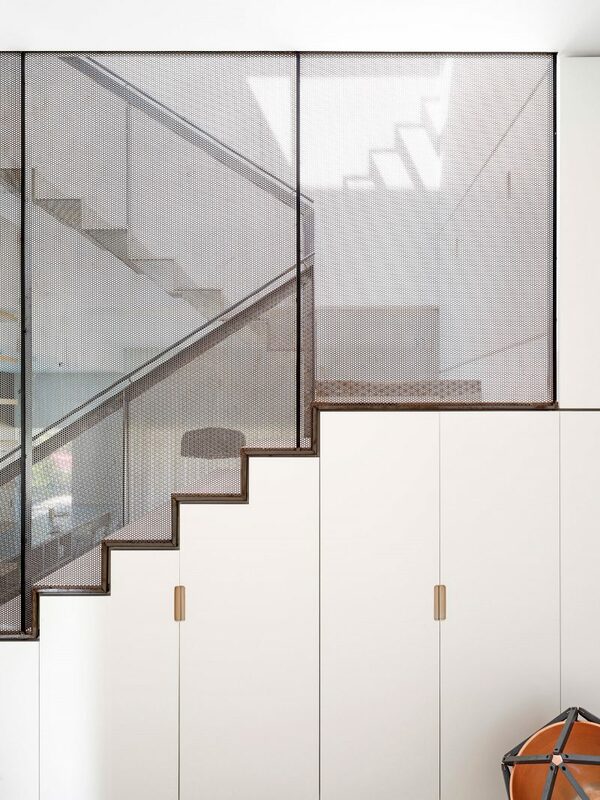 The stair is the lightwell in the centre of the house, leading to generous openable skylights. 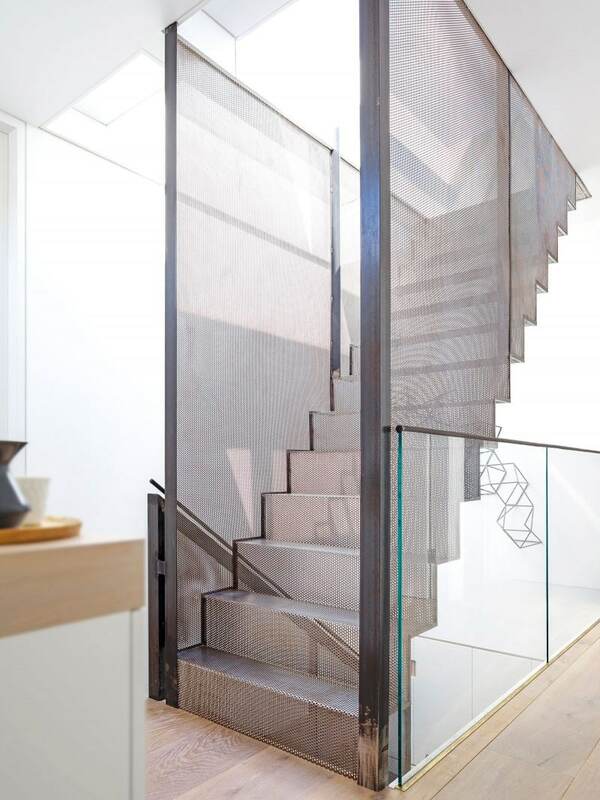 The stair balustrade, constructed in perforated steel, allows the light to tumble down, even the upper stair flights are constructed in perforated steel, the layering of the semi-transparent steel sheets create a moire effect. 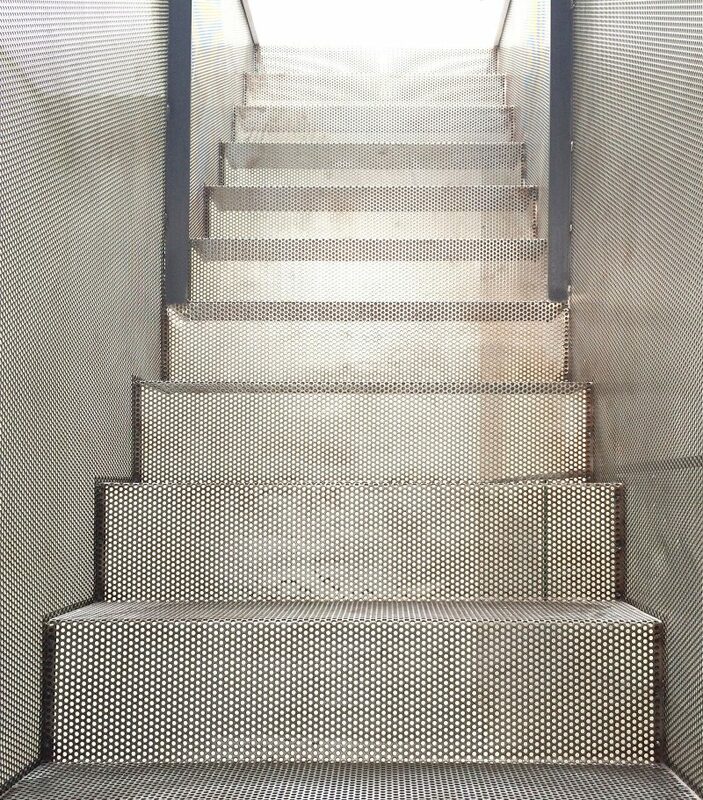 The perforated steel is finished with a clear lacquer over the raw “black” steel, a mill finish of the mild steel. Welds have been carefully concealed behind minimal edge framing. 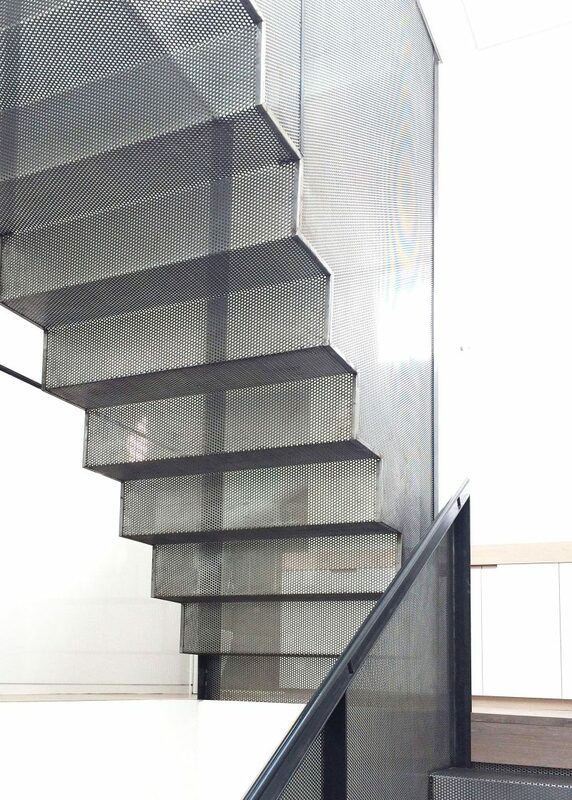 Behind the balustrade one can see the folded, perforated steps of the second stair flight. From the first floor landing the stair rises to the roof access hatch. This flight is suspended from the roof frame. A Gorter http://www.gorterhatches.com.au/ glass hatch allows access to check and maintain the array of solar panels on the roof. 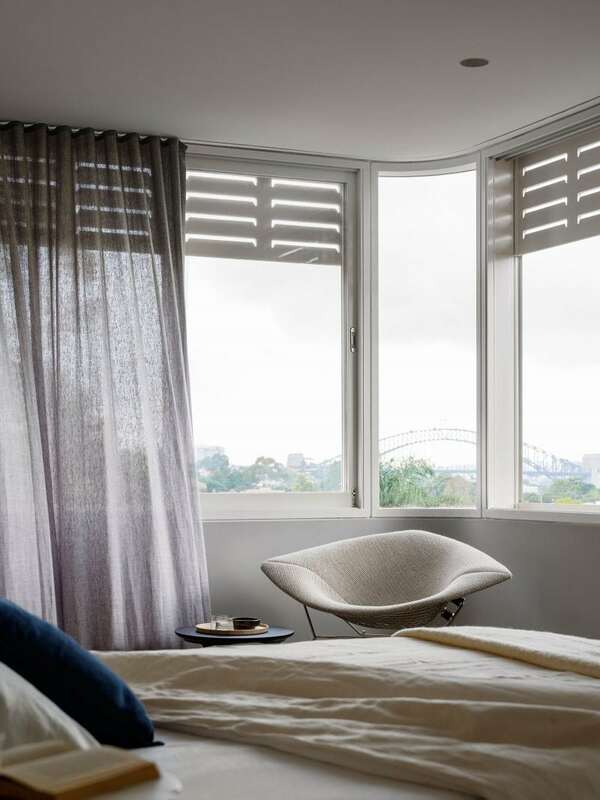 Sydney Harbour Bridge view from the bed reflected in the Dedece Bertoia “Diamond” reading chair. 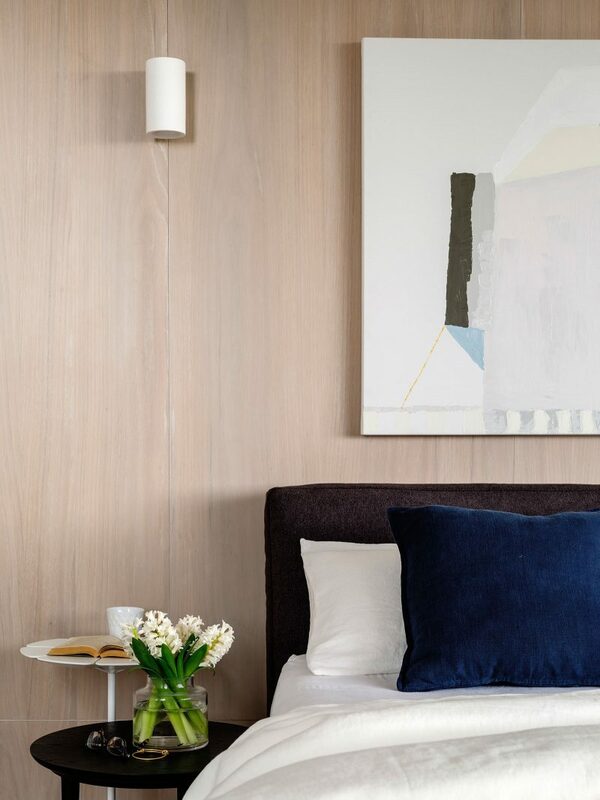 The limed American Oak wall panelling behind the bed provides a textured neutral backdrop to Romaine Alwill’s fabrics and furniture. 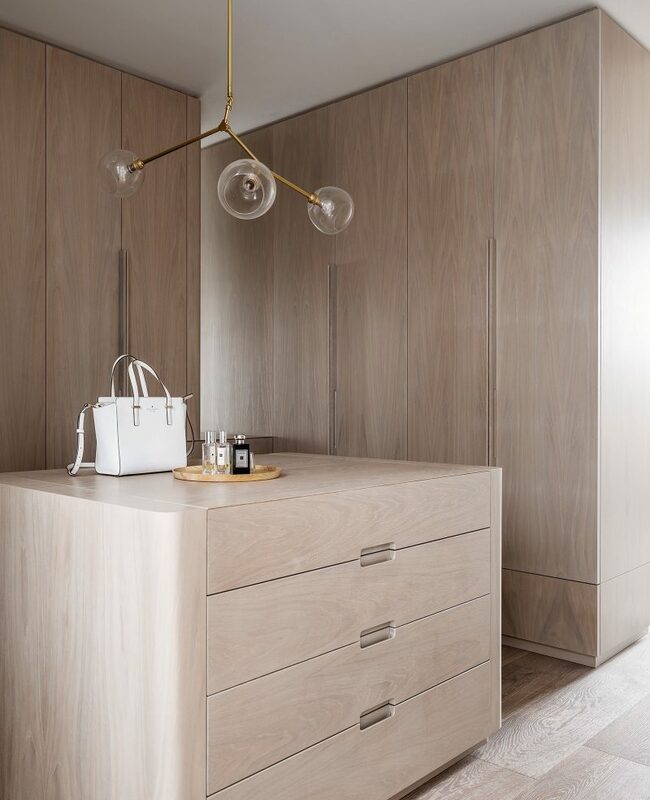 The dressing room joinery was designed by the project architect, Sean Johnson & Romaine Alwill in collaboration and includes a central drawer and dressing table unit. A slot connects to the ensuite master bathroom. Why not have a chandelier in your dressing room? The Douglas + Bec “Y” brass and blown glass light feels at home here. 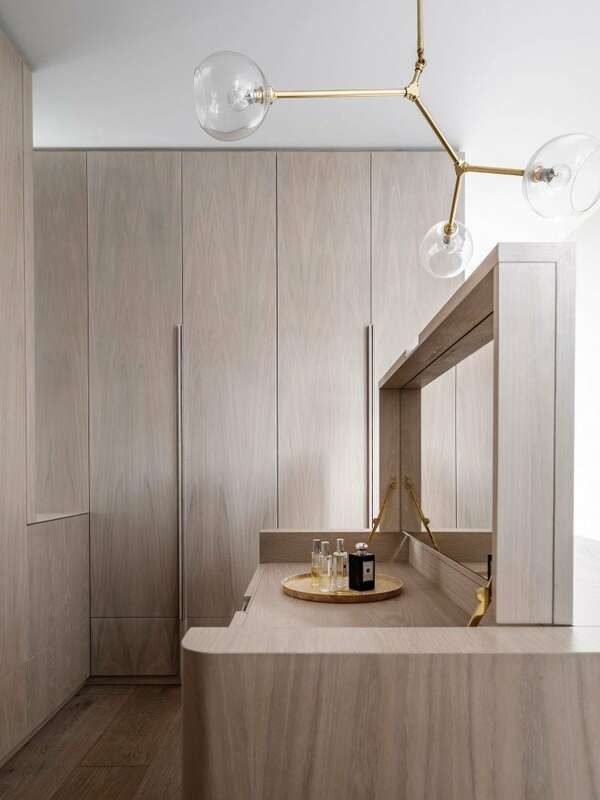 The dressing table is built in the central island unit. Sydney Joinery executed the cabinet work with supreme craftsmanship. An unusual suite of Powder Room and Guest Bathroom, with a mill finish. 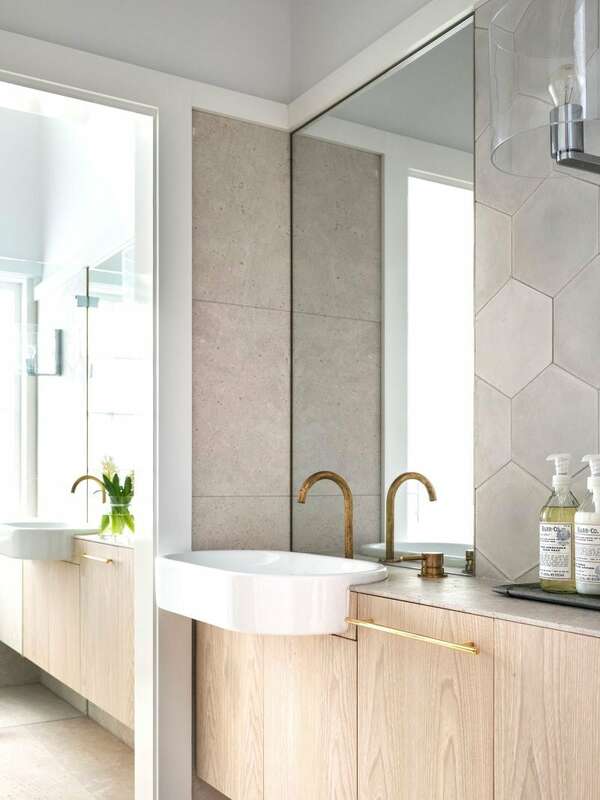 Matt brass Broadware taps and spouts and Poppham “HEX” encaustic tiles. The kids’ bathroom “cubby house” feel was accidental, being located in the existing roof space for convenience. 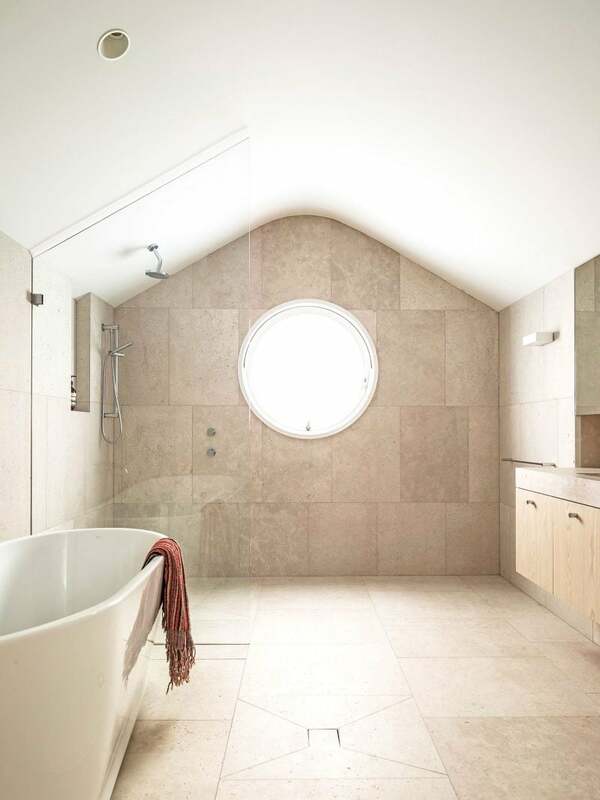 The round window on the north face of the house casts a circular sun spot on the limestone floor. The Caroma Blanc bath introduces the children to the lux life. 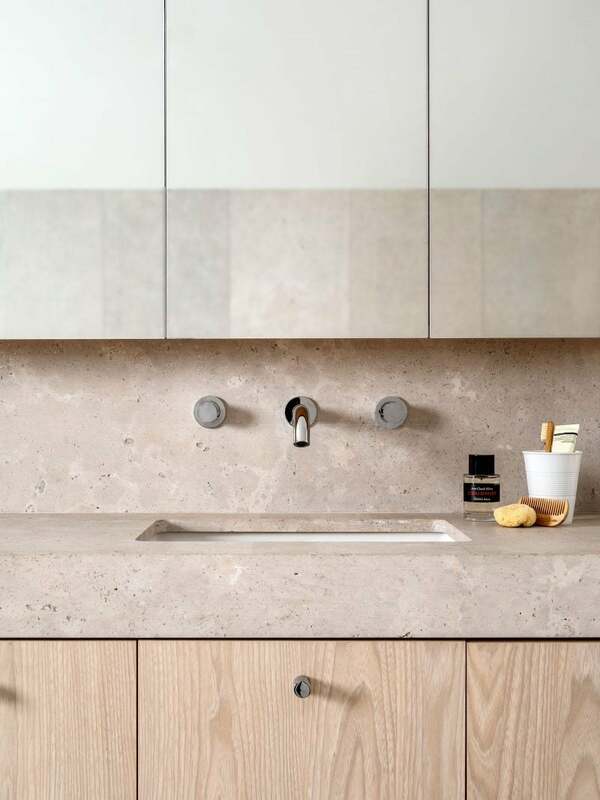 An Aren Bianco limestone texture and limed American oak again offer tonal and textured balance. This sitting area is in the old house, a smaller room off the living-dining at the back. It is a restful alternative, converted to a study and play area, with a fabric covered pinboard. Lisa La Pointe artwork “Magi” brings life to the restful dark “Half Masala” Resene paint. 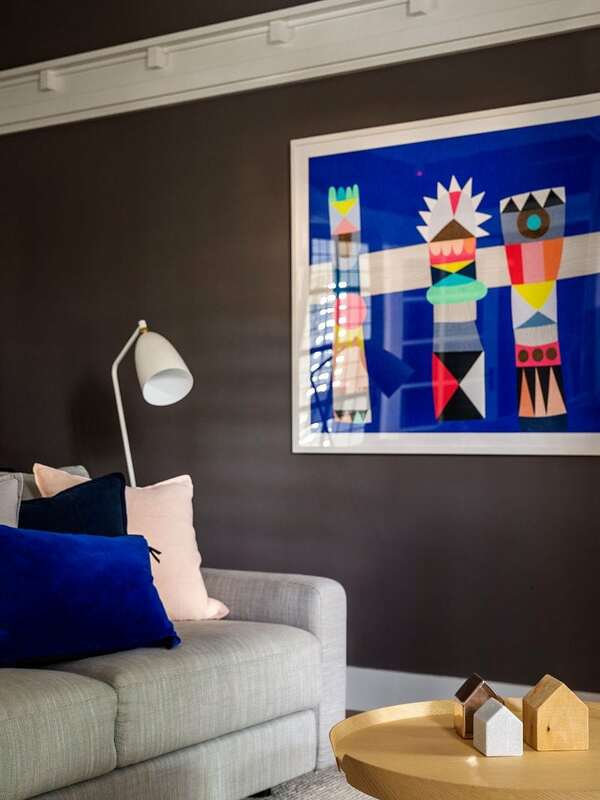 The Grasshopper light by CULT and the MUUTO Scandinavian “Around” coffee table.